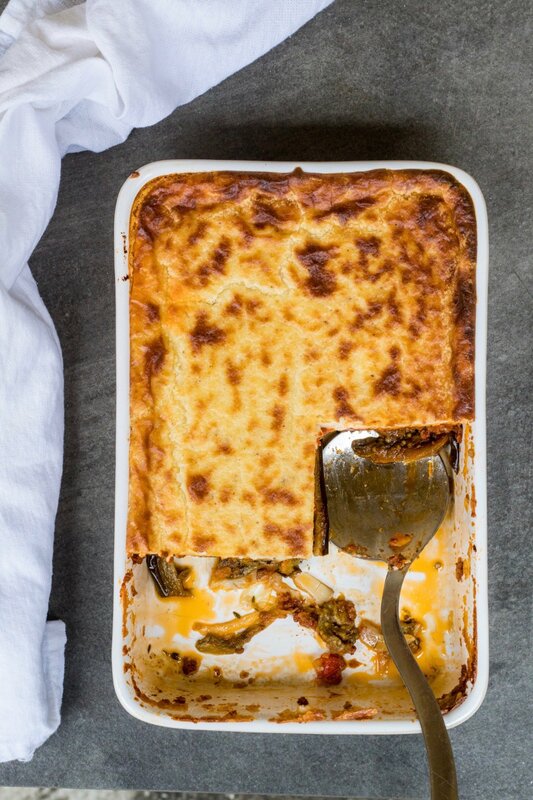 I could eat moussaka all day everyday! I would not tire of it. I am a huge fan of ground meat — I know I should be so ashamed to admit it but I’m not. Is anything more comforting than a good bolognese?!? Well believe it or not this tops it in the comfort food department. It has all the right components of a comfort food — meat, potatoes, and a cheesy creamy sauce, and includes a delicious spiced ground meat sauce that is just so rich and fragrant. 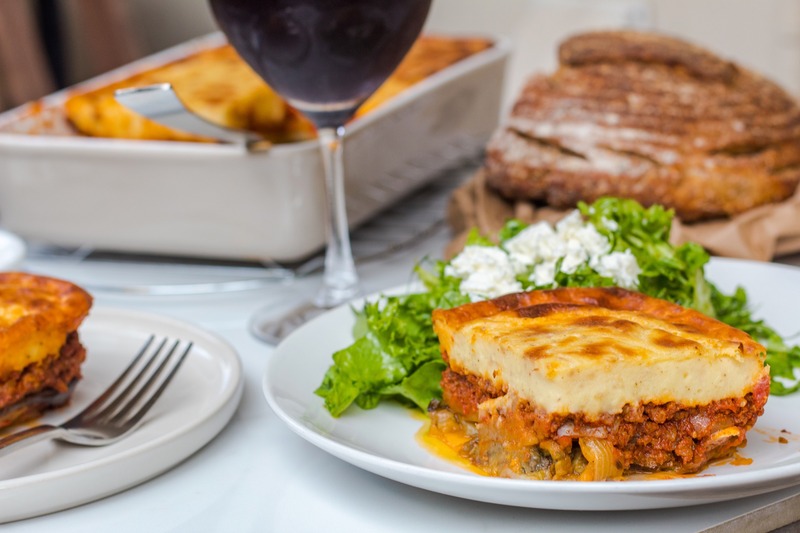 In case you have never had moussaka, it is a layered dish with layers of potatoes, sweet eggplant and topped with a layer of that meat sauce and finally a luscious layer of béchamel sauce. Like most ethnic dishes everyone has their own interpretation of it. 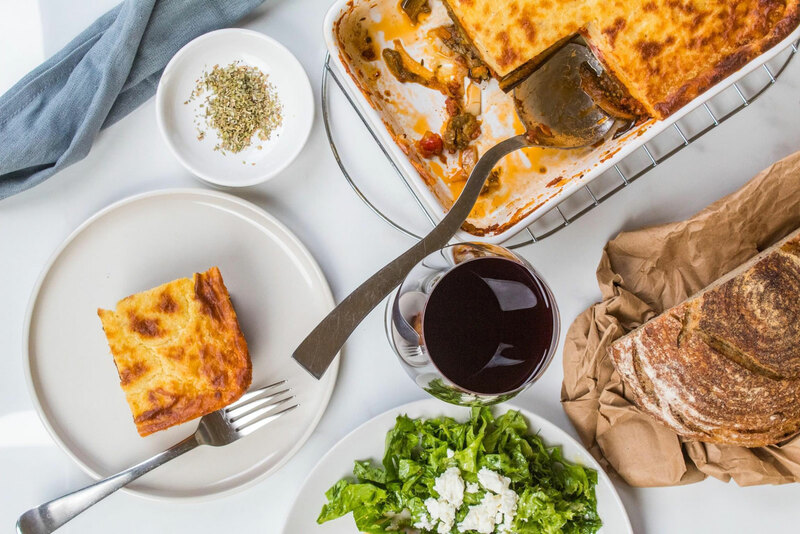 Moussaka is no exception. 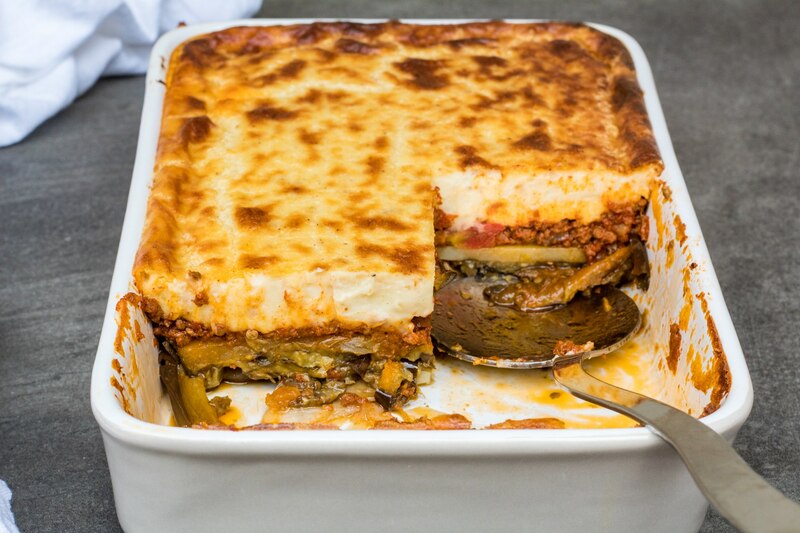 The items mentioned earlier that make up a moussaka can have some variation within them. For example many fry the potatoes and the eggplant before layering but I prefer to roast them. It’s less messy and I find it’s a lot quicker because you roast them all at once, and the moussaka is less oily. But that is just my opinion and how I like to make mine. Some people put the meat sauce between each layer of the veggies but I just line the bottom with some sauce and use the rest on top of the veggies. I roast the veggies with onion and herbs and the veggies are very tasty on their own and I don’t think they need the sauce in between their layers. So you see, it’s really almost as versatile as a lasagna except the main components stay constant. 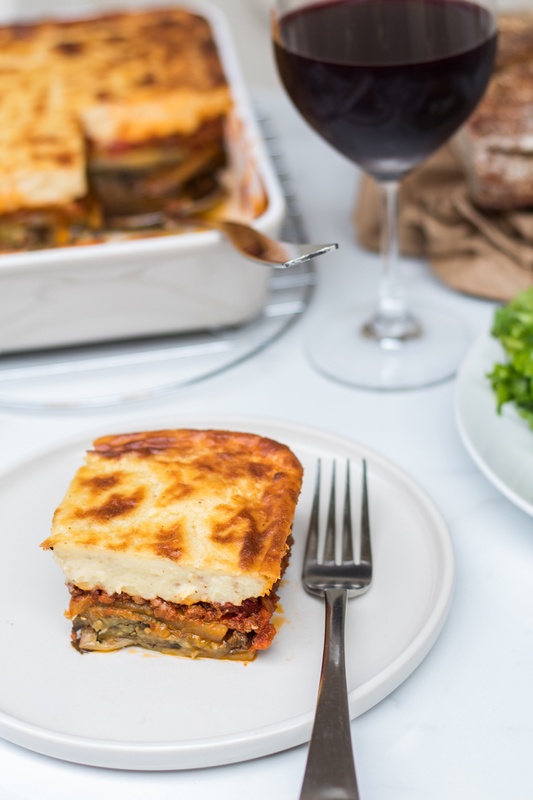 This is how my mom makes her moussaka and I tweaked and added my own little flair here and there from little tips I have picked up from making different ones over the years. There are a few steps involved in making this dish but it’s one of those dishes that once you get the ball rolling, it comes together pretty quickly. I have made it so many times that I actually have it down to a science now. I preheat the oven while I wash and peel the potatoes and slice them and the eggplant and toss in the oil. By the time I have them on the baking sheet the oven is good to go, then I get the sauce going and once it’s simmering I start on the béchamel, and by the time the sauce is done the veggies are cooling and the béchamel is done and everything is ready to layer. You blink and it’s in the oven! Hee hee! It involves a little more effort than that but I’m just trying to say don’t be intimidated by the three separate components. One thing I do all the time especially if I’m making this for a dinner party is that I roast the veggies and make the meat sauce in advance and layer them right in the baking dish I plan on using the night before or the morning of, and then I refrigerate it until I’m ready to make the béchamel and bake it. 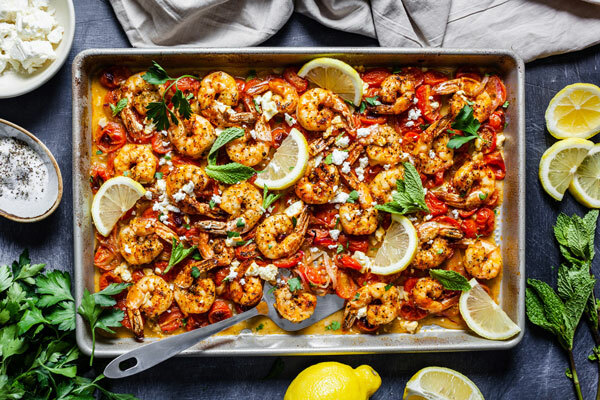 It’s a fabulous dish for making ahead. You can make the béchamel ahead of time too, just refrigerate in a separate bowl and place plastic wrap right over and onto it to prevent a milk skin from forming on it as it cools. I like making my béchamel right before I bake just because. But either way is fine. I find that doing the meat and the veggies in advance not only saves time but because they are cold and the meat sauce is kind of hard or firm — the béchamel stays more separate from the sauce, defining the layers more. You can do this with the tip I mention below as well by adding a little of the béchamel to the meat sauce to help it thicken or bind. Because this dish is rich and a little heavy from the whole meat, potatoes, and cheesy sauce thing; I like to keep the sides light. I will always serve it with a little bread cause I’m Greek obviously, and some feta for the same reason but I love it with a light maroulosalata. That is a simple lettuce salad with fresh herbs and a tangy vinaigrette. Of course a glass of vino is definitely in order too!! That truly makes for a fabulous dinner. The best thing about it is that it can feed a crowd and is kind of budget friendly if you think about. The most expensive component is the cheese. The meat I guess too, but ground meat is a little more budget friendly than most other cuts. Also it can be altered to make it gluten free, vegan and vegetarian as shown below. Lets talk about the cheese for a sec though. Typically you would use Mizithra cheese in it’s salted aged form for the béchamel sauce. Mizithra is cheese made from goat or sheep’s milk and I totally love it but I have never seen it here in Trinidad and that’s why I use Parmesan cheese. So if you can’t find mizithra, Parmesan is a great alternative but if you can find it, use it! It’s fabulous!! Vegan - meat alternative is the same as vegetarian and feel free to use almond milk or coconut milk with your flour of choice and use nutritional yeast for the Parmesan cheese and completely omit the eggs and just make sure you make it a little on the thicker side. Use olive or coconut oil or a vegan butter to replace the regular butter. 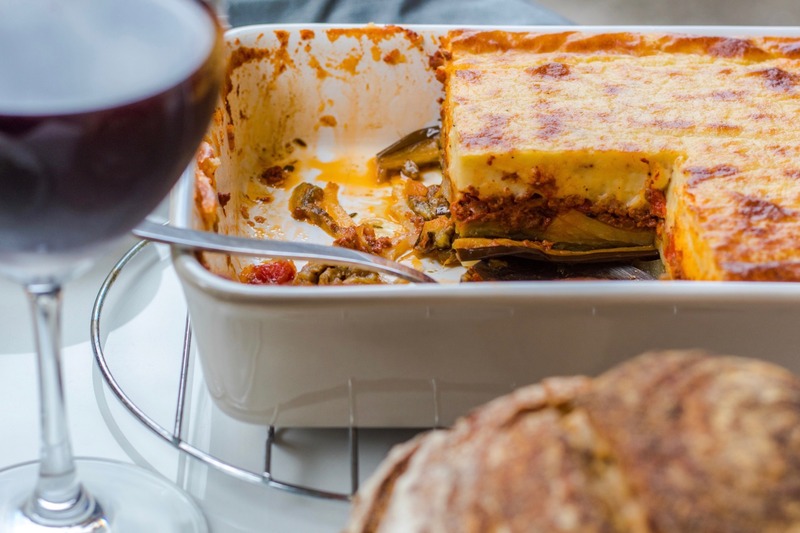 It will not taste exactly the same but it will still make for a creamy topping for your moussaka. Once butter is melted and starting to bubble, add the flour and continuously whisk for a minute or two letting the flour cook. To assemble start with a thin layer of sauce at the bottom of a baking pan and then I usually do potatoes eggplant and potatoes again but you can change that up if you would like - I like the potatoes at the bottom because it makes slicing easy and your pieces stay together better while serving. I also add approx 1⁄4 cup of the béchamel sauce to the meat sauce after I do the initial layer at the bottom of the pan and what this does is it helps bind the sauce a little and create more of a separation between the sauce and béchamel - this is totally optional it will not affect the flavour of the moussaka in any way if you don’t do it. Let stand for 30 min to an hour before serving to let it set and make it easier to cut and plate - if your concerned about all of that, otherwise just dig in! It will just be a little messy! Serve and enjoy with some crusty bread, feta, some maroulosalata and some wine of course! !